"Hello. Is this the room ? Is this, is this, is this the room ? Uh, I suggest, that uh, yes it is. Are you the one that, uh ? Are you the one that, uh ? Are you the one that, uh ?" Billed as "The Seahorses as you've never heard them before", 3 Wide is a strong b-side, with a razor-sharp guitar lick. "Since then, there've been a few things that no-one's seen. I did some plaster casts of my own hand, some sheep and rabbit skulls painted in a floral pattern called 'It's Sophie's Birthday.' And a three-metre-wide butterfly - that's the biggest thing I've done. I also made a hand out of a metal bucket using my cousin's electric welder. "At the moment I'm concentrating on the oral rather than the visual. I should paint more, really. But every time I turn round to do it I can't find the brushes. I always paint on the floor. An easel's too serious - I have this aversion to berets and palettes and capes. I'm sure doing more painting would make life easier - instead of reaching for the Nurofen." 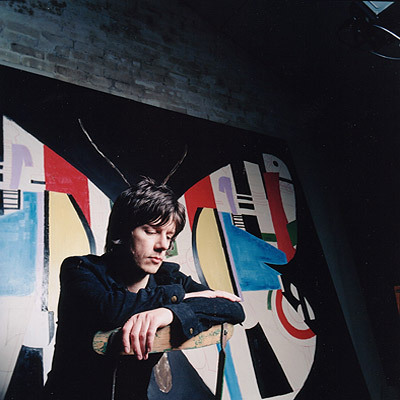 Top left: Squire carefully positioned in front of the antennae of 'Léger City Butterfly'. 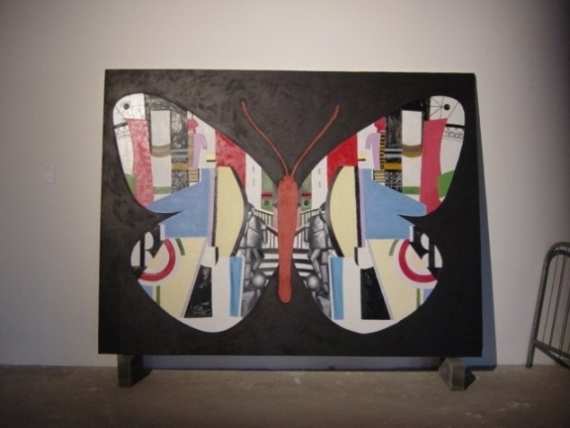 Top right: 'Léger City Butterfly' (oil and acrylic on canvas, 90" x 120", 2001), from the Manchester exhibition, May 2004. 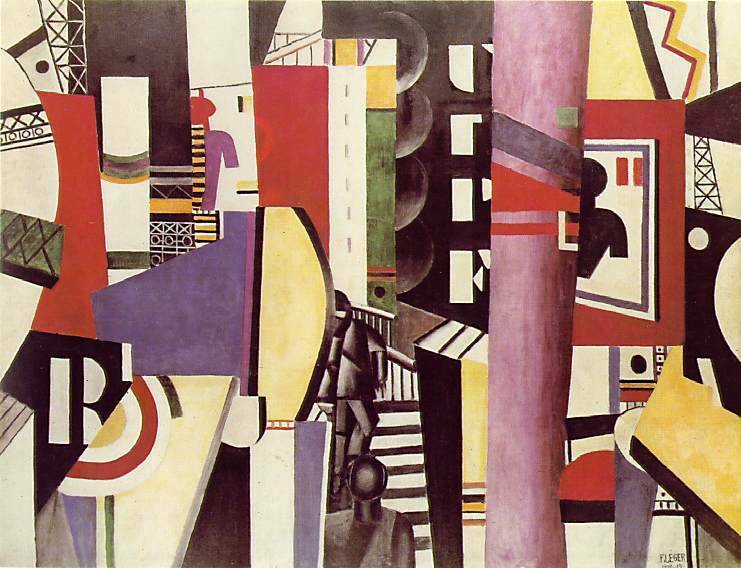 Bottom: 'La Ville' ('The City') (1919) by Fernand Léger. Squire's artistic work focuses on the left hand side of Léger's 'La Ville', using the disc shapes to create butterfly markings via symmetry. In 'La Ville', overlapping and layered planes depict urban density, and fragments show the speed of urban experience. The broken views of billboard texts and images indicate not only the multiple stimuli available in the city but, even more, the speech with which residents traverse urban space. Léger was a French painter, sculptor and filmmaker. In his early works, he created a personal form of Cubism which he gradually modified into a more figurative, populist style. As one of the first painters to take as his idiom the imagery of the machine age, and to make the objects of consumer society the subjects of his paintings, Léger has been called a progenitor of Pop Art.